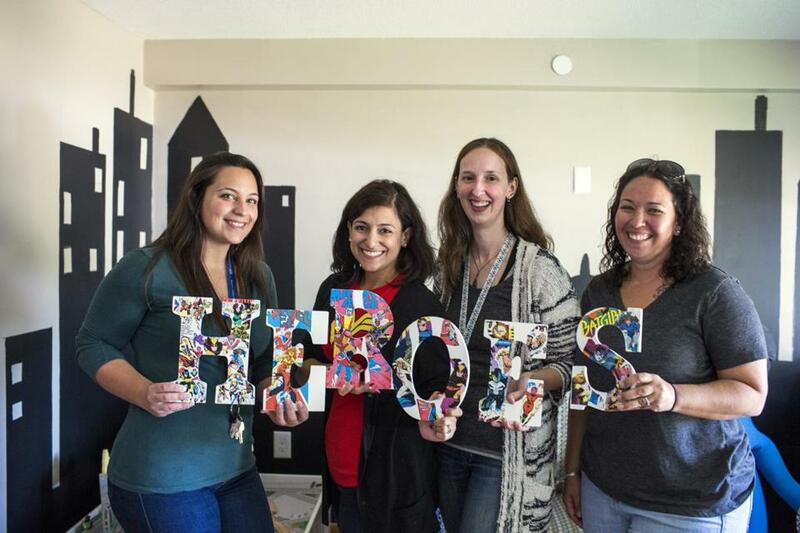 (From left) Gina Coyle, Sarah Kostecki, Valerie Krpata, and Kathleen Jeffery at the Little Heroes Home . DRACUT — The three-story building sits, sunny and open, on a rural, quiet residential street. Inside, child-made arts and crafts festoon the walls, and the feel is that of a kindergarten — cheery, comforting, with toys and games all about. A large painted mural of a city skyline adorns one living room wall. The place is new, with decorations still being unpacked and hung up. White, wooden letters spelling out “HEROES” lie on the floor, adorned by a collage of Marvel and DC comics characters. The staff is still not sure where to place them. The Little Heroes Home feels anything but clinical or institutional — and that’s the point. Funded by the state’s Department of Children and Families, the group home for children ages 5 through 11 is the first of its type for the Justice Resource Institute, a Needham-based agency that began in 1973. It’s meant for kids who have suffered trauma, including abuse and neglect, in the hope that early intervention can help them grow into stable adults. It’s meant to be a temporary home for them. The state’s goal is to reunite the children with their extended family members or to find foster or adoptive homes for them — to spare them, if at all possible, from growing up in a succession of institutions. But the foster-care model on which the state relies clearly doesn’t work for all kids. Indeed, of the first 12 children to live at Little Heroes, 10 have already been in the foster system. None of them came directly from foster care to the home, said Kathleen Jeffery, its director. Instead, they all came from hospitals or other programs that provided them short-term, emergency beds. One, a 7-year-old girl, came from a hospital. “Since she’s been here, she’s been doing fantastic,” said Jeffery. Then there are two brothers, ages 7 and 8. “It’s good they were able to stay together,” she said. Jeffery declined to name the children for privacy reasons, but said the stories of all 12 are similar: backgrounds of chronic abuse and trauma, with disruptive placement in foster homes that didn’t work for them. Now, they’re here to develop coping skills. 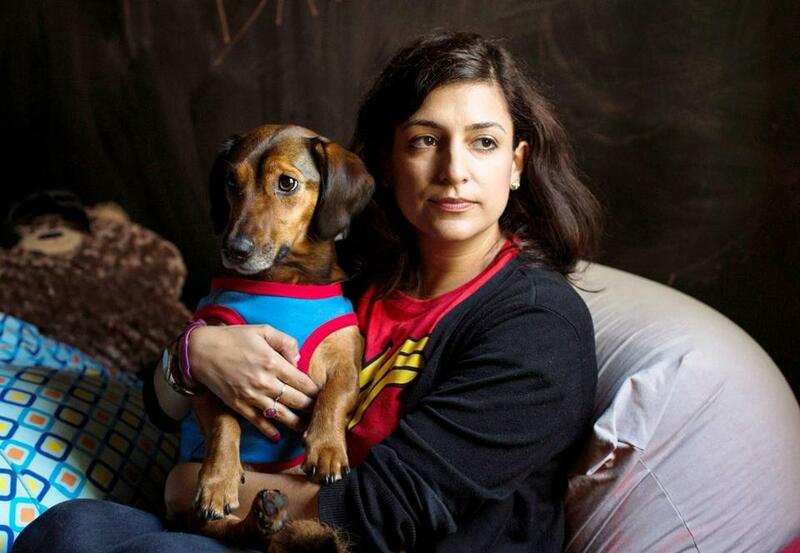 Thus the home’s superhero theme, one that is reinforced throughout the place, right down to the Superman shirt worn by Ellie, a friendly, dachshund mix owned by Sarah Kostecki, the home’s director of operations and clinical services. Sarah Kostecki brings Ellie to interact with the children. The goal, said Spinazzola, is to take the kids’ incredible energy and channel it into productive ways of coping, including positive interactions with peers and a newfound sense of trust. Aligned with this theme is the “bat cave,” a small, darkened room painted so that visitors can draw or write on its walls. It functions as a safe space for children who need time alone. Although the room is never used as a mandatory time-out venue or for punishment, staffers will sometimes encourage kids to step into it with them if they’re not getting along with their peers or seem to need a breather. In the world of such institutions, the idea is hardly new. But program director Cindy Powers said the execution here is what sets it apart. The bat cave “is a little more creative. It’s a little more cool . . . [they’re] not seeing it as a punishment,” she said. It’s very much in keeping with the home’s suburban vibe — the lawn, the basketball hoop in the driveway — all meant to give it a feel other than that of a shelter for child trauma victims. Just how long each resident will call the place home is decided on a case-by-case basis. But the state’s end goal is always to get these kids out of the institution and into a family setting, sometimes with extended family members who were not responsible for the children’s traumatic pasts. “There’s a lot more family involvement than we anticipated,” Jeffery said. Family members, accompanied by social workers, sometimes visit the children, or vice versa, although so far not overnight. Just how great the need is for such programs statewide is hard to determine: The Department of Children and Families, a spokeswoman said, doesn’t maintain master waiting lists for group homes or foster placement. Within four weeks of its July 18 opening, however, the Little Heroes Home had a waiting list. And to help such kids readjust back into a traditional home life. Vanessa Nason can be reached at vanessa.nason@globe.com.